From ancient concepts of golems to clockwork automatons to fully synthetic, sentient beings like Star Trek – The Next Generation‘s Data, artificial humans have been part of our shared mythology for quite some time. In these days it is not uncommon for robots and other automated machinery to perform a variety of tasks. Auto production has been using robotics for quite some time, for example, and more advanced robotics are being worked on every day. So, it’s no wonder that robotics would start to popping in even recreational venues. Enter the Robot Bartender. Caribbean Cruise’s Quantum of the Sea has a robotic bartender. There are bartender machines popping up for home use, even. Machines are making cocktails, and what does this mean for those of us, flesh and blood, in the bar industry? Well, right now, not a lot. Robot Bartenders aren’t very commonplace as yet, but the question is: “Will they be?” or more accurately, “Should they be?” Is there a place for these robotics drink slingers? Are things better when a robot makes them, or should drink craft be left in the hands of human bartenders? There isn’t really a definitive answer, so let’s take a closer look at some of the issues. Robotic bartenders will ensure a greater continuity of drink quality. All drinks will be identically made, in essence, they’ll all be perfectly proportioned. No matter when you order a Manhattan it will be the exact same drink each time. Then again, there isn’t really any variance when human bartenders make the same drink if they are following the same recipe and method. If I make a Manhattan and Dorian makes one the drinker shouldn’t be able to tell the difference between them. The main difference here is that each time the robot will produce the exact same thing. Whereas when Dorian and I make the drink there is always the chance for some variables to slip in. A slight difference in proportion, or in length of stir time. So, yes, in terms of consistency the robot is better. Drink preparation is only one aspect of a bartenders duties. There is also the issue of interaction with our guests. As yet we do not have the ability to create a robot capable of spontaneous interaction with people. Robots can be programmed to react certain ways, but they’re not quite at the level of dealing with us on a truly “human” level. So in this area, the ability to not just talk to our guest, but converse, and for a short time at least, befriend our guests humans have the advantage. When it comes to performance we may have a bit more of a tie. Robots can be programmed to perform tricks that humans can’t. But humans are more susceptible to failure, to dropping things, to making that last minute save, thus to making things more spontaneous. While a robot can be taught to flair, a human can make a show of it. Humans can read and respond to the atmosphere, and alter what we do and how we act on clues from the guests and from input from the environment. This means that each time a human bartender makes a drink it creates a unique experience. All that being taken into account there are some venues where a robotic bartender could certainly come in handy. There are times when a place is so busy, so hopping that human bartenders can get overwhelmed. I know I’ve been in that situation. It’s rush hour at the bar and grill, the floor is packed – all tables full. The bar seats and cocktail lounge is full, there are people standing 3 deep at the bar, and there’s a wait list a half hour long at the hostess station. The two bartenders on duty are responsible for serving high quality drinks to their seated guests, while also serving those standing at the bar. Servers are sending in drink tickets, sometimes with 6 or more drinks on them. It’s frenetic, chaotic, and exhausting work. Oh, those hardy bartenders can certainly get it done, no worries, but it is stressful beyond belief. Enter your friendly neighborhood Drink-O-Tron! Set one of these bad boys up by the server station. Servers can send their tickets to the Drink-O-Tron and get them in an efficient manner. This gives the bartenders more leeway to properly serve both their seated guests and those standing at the bar. 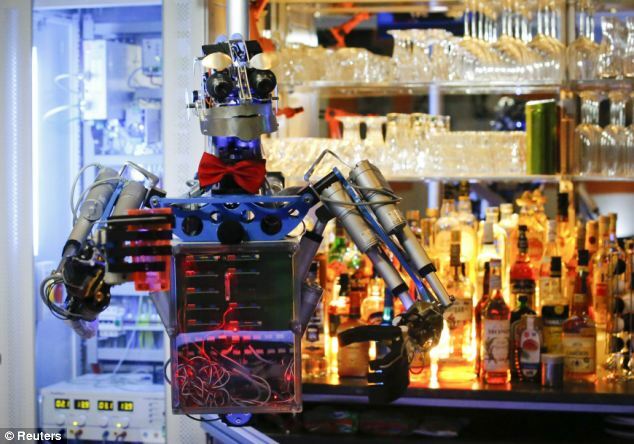 Will robot bartenders ever take the place of human ones? Doubtful. There is too much to be said for the interaction between bartender and guest. People will still want to pull up a stool and chat with their bartender, spill their woes (but please, not their drinks!) and commiserate. There is still something about the way one bartender makes a drink and presents it versus another. Even if the drinks are technically identical, they are different. There’s the passion and love a bartender puts into their creation that can make all the difference.